The Samsung Galaxy Note 9 isn’t set to be announced until August 9 but by now almost every detail surrounding the device is known, covering everything from specs and design to the fact that Fortnite will be a Galaxy Note 9 exclusive for 30 days. And now, with just over a week to go before the event, nearly all of the flagship smartphone's official cases have leaked online. Following in the footsteps of previous launches, a wide variety of official cases will be made available to purchase from Samsung. These will include the usual Clear View Case, LED View and Leather covers, the Silicone Cover, and the Protective Standing Cover, with each one adopting the same overall design seen with previous launches. 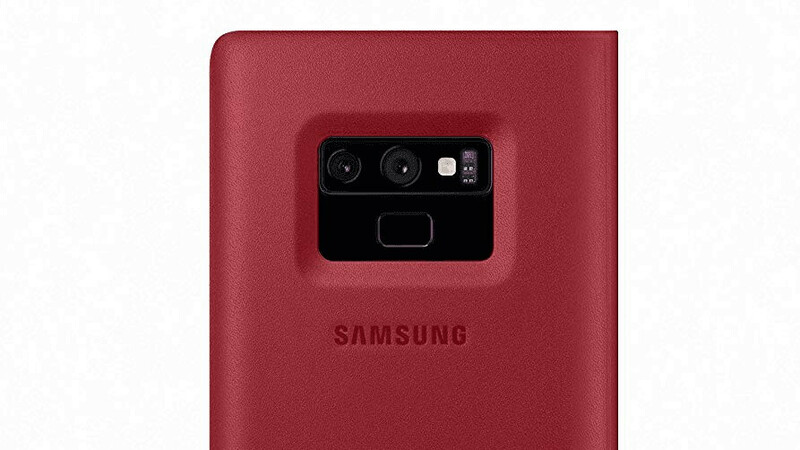 In regards to options, it appears the Clear View Case will be available to purchase in the Galaxy Note 9’s official colors. This means blue, black, copper, and lavender variants are all in the works. Likewise, the LED View case will also be available in these options, although no images of the copper-colored case have appeared as of yet. Moving on to the Leather Cover, Samsung will seemingly offer it in red, black, and brown, while the official Silicon Cover is set to be made available in white, black, lavender, and blue. Lastly, in regards to the Protective Standing Cover, this will once again be sold in black and grey. Currently, shipments of both the Galaxy Note 9 and its accessories are expected to begin on August 24, roughly a month before Apple’s new iPhone lineup is set to go on sale. However, with Samsung betting solely on hardware and software upgrades with its next flagship, it’ll remain to be seen if the Galaxy Note 9 can make up for lackluster Galaxy S9 and S9+ sales that have been registered so far this year. Better this, than mere iPhone. S Pen makes all the difference hands down. Only if Apple decides to have the Apple Pencil work with iPhones, that would actually make me switch. If Apple made the Apple Pencil compatible with iPhones, you would still have to carry both devices, instead of conveniently pulling out the S Pen whenever you need it. I'm sure of that because I had/have 6 different Galaxy Notes so far. I carry a separated full-bodied S Pen because it's easier to handle, other than the one in the silo. Digital Drawing is my thing. Very minuscule complaint, but what an awful looking camera/FPS cutout on all of these. It's the same feeling I get from the S9+ cases, thanks to the flash/heart rate sensor being separate next to the camera instead of part of the vertical stack. I'm going to be so glad for next year when the FPS is finally under the display, making for a much less cluttered looking backside. Sshhh... These sets of case are made to protect note 9 user's virginity. Apple will send this phone to Oblivion once it's announced. Expect to head to your local carrier to buy your wife and kids one. Wow, really? You sound so confident and knowledgeable. Better get a case. These glass phones, especially curved glass, are simply FRAGILE. This needs to be remedied.